The General Motors auto family is populated with plenty of different vehicles that can all offer something different to drivers. Power and unrelenting toughness comes from brands like GMC and Chevrolet, but for those more inclined to go a more luxurious and classier route, the Buick model line is a prime choice. With sophisticated-yet-affordable options up and down the Buick family, it’s no wonder why so many consumers today have placed their trust in these models to get them where they need to go with enjoyment and fun along the way. Our Apex Motorworks team is happy to present some of the top used Buick vehicles near Chicago IL to you, and we invite you to join us in checking out what we offer, as well as how you can get inside for a test drive! 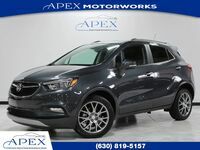 Every part of the automotive spectrum is represented in our Buick line, as we feature top SUVs like the Encore, available in Sport Touring trim. We also offer the LaCrosse sedan, one of the strongest and most fuel efficient luxury sedans on the American market. To top it all off, you can also find a turbocharged 1987 Buick Regal with a turbocharged engine and plenty of awesome upgrades to boot, right here at Apex Motorworks! Here at our dealership, we’re happy to help you get behind the wheel today for a price that can fit your budget. Be sure to make your way over to our credit approval form, and we can get you approved for a financing deal in seconds – if you have any further questions about our current inventory, be sure to contact our Apex Motorworks sales team today. We’re always happy to get you inside for a test drive at the best date and time for your schedule, and we look forward to seeing you!